This Christmas Homemade Granola recipe is loaded up with the delicious flavors of the holiday season. Naturally vegan and gluten-free, it would also make a pretty homemade Christmas gift for someone you love. I regularly make a batch of granola on a weekly basis, so I thought it would be fun to share a more festive version to enjoy during the upcoming holidays. 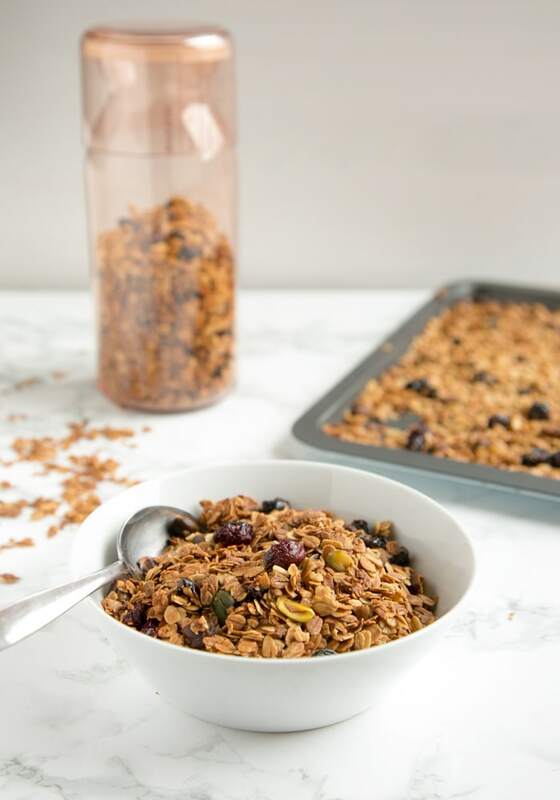 I prefer to make my own granola whenever I can, as I can easily control the taste (I like a less sugary granola than most commercial ones sold in stores) and customize it with my favourite ingredients. This crunchy, healthy Christmas Homemade Granola is totally vegan, gluten-free and so much better than store-bought. 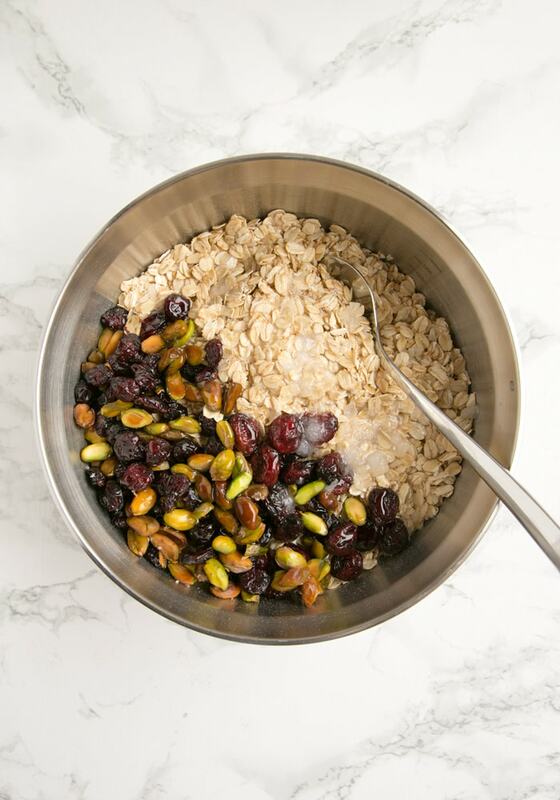 Best of all, it doesn’t require more than 10 min to put together, and it involves very simple ingredients such as: jumbo oats (make sure to use certified gluten-free oats if needed), dried cranberries, pistachios, pure maple syrup, coconut oil and a pinch of orange essence (but vanilla extract would work just fine). This Christmas granola is so easy and quick to make that the most laborious task is weighing up the ingredients. I often pre-weight all the dry ingredients and pop them into a jar, so that the whole granola-process doesn’t take me more than 5 mins. My new favourite jars are these smart Brabantia measuring jars, which are designed to help you cook just the right amount and reduce food waste. 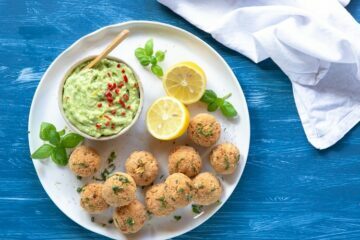 As well as being great for storing all kind of dry ingredients, they make portion control of the most common everyday grains (such as pasta, rice, cous cous, etc.) a total breeze. I’ve also used these jars to store my freshly-made granola and give it out as a pretty homemade Christmas gift to my neighbors. They totally loved it! For every jar sold, Brabantia will make a donation equivalent to training one person to The Hunger Project – a global, non-profit organisation committed to the sustainable end of world hunger by 2030 through training and investing in women and men living in rural villages in Africa, South Asia and Latin America. You can read more about Brabantia’s commitment to The Hunger Project, and the organisation’s work here. Now, back to this awesome granola for a moment. 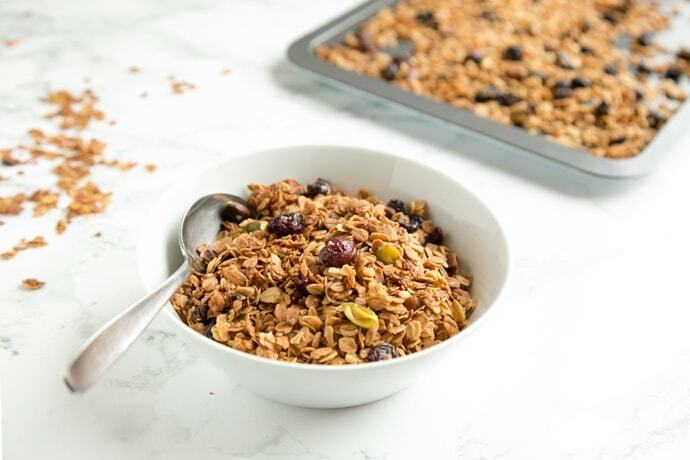 Depending on your taste, you can easily customize the texture of this granola. If you like crunchy clusters, make sure to wait until the granola has cooled before breaking it up. 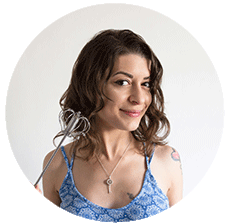 If you’re more into a flaky texture like me, break the granola apart while it’s still warm. This Christmas Homemade Granola recipe yields a good-size batch, so you can make it on the weekend and enjoy all week long, or put some into jars for a fabulous Christmas gift for someone who appreciates homemade gifts. 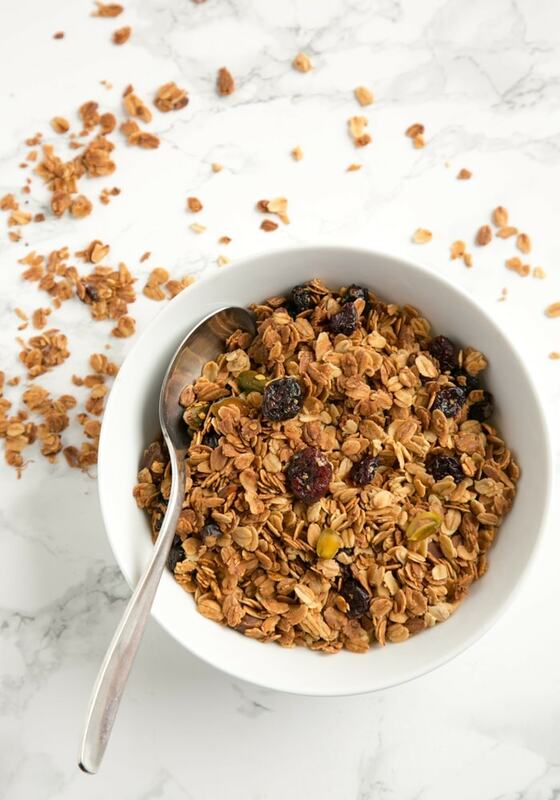 As wonderful as a simple bowl of granola with milk or yogurt can be, granola is a versatile ingredient than can work in all kinds of recipes. – This Granola Nectarine Yogurt Parfait takes just 5 min to prepare and makes a nutritious breakfast on the go. – These easy Berry and Mascarpone Granola Tarts are so cute, and would make such a pretty dessert. – Make Granola Chocolate Balls! These are so good, and only 3 ingredients. Granola, milk and chocolate! Pre-heat oven to 140ºC/120ºC fan oven. In a large bowl mix together oats, pistachio and salt. Add coconut oil and maple syrup into the dry ingredients and mix thoroughly until combined. 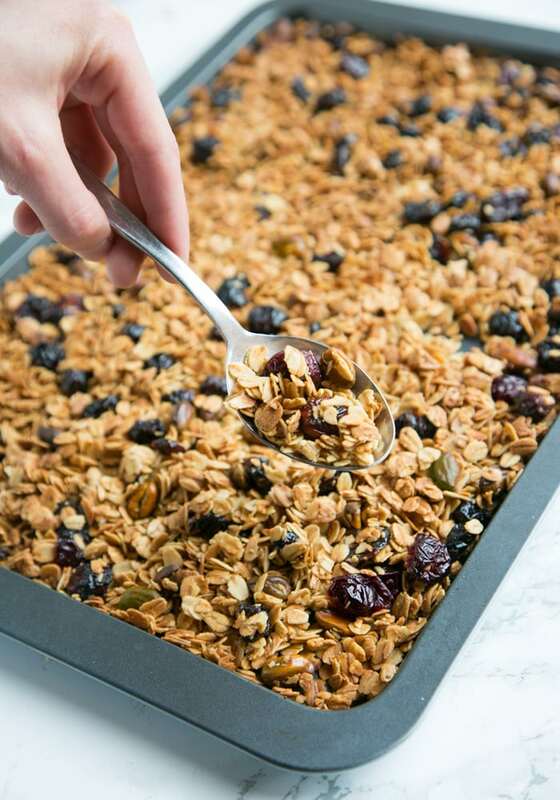 Spread the granola mixture on a large non-stick baking tray. Bake for 40 minutes, gently stirring the mixture with a spatula every 15 mins or so. Do not over stir, as this prevents the granola clusters from forming. Remove from the oven and mix in the dried cranberries. Return to the oven and bake for a further 10 minutes, until granola is golden and crunchy. Remove from the oven and allow to cool. 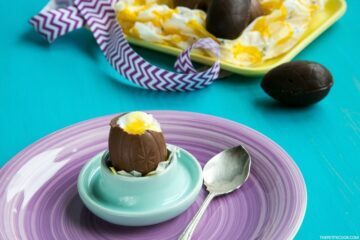 Break into clusters and enjoy for breakfast or as a snack during the day. Store in an airtight container or large jar for up to 1 month. 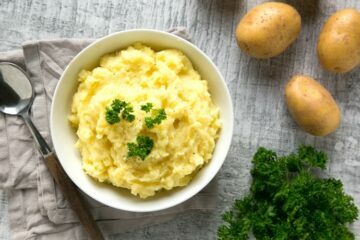 Simple and healthy. That’s a good combination. Thanks for sharing, and Merry Christmas! Mmm YUM!!! this is perfect! I totally agree that homemade granola is better than store-bought. And love these flavors for the season! I love the pistachio-cranberry combo, not to mention the idea of giving this out as a gift in those sweet little measuring jars! What a perfect little holiday gift! A really good granola recipe! I agree, making granola at home lets you control the sugar content, a very important consideration. I never eat store-bought granola for this reason and prefer to make my own. And this one’s so easy anyway! Pistachios and cranberries are such a good combo!! Homemade granola is the best – perfect for breakfast, snacks, even dessert. Those jars are super cool – definitely checking them out!